Gotzkowsky, Berlin 1761-1763. Porzellan, polychrom bemalt. Blumenbuketts und Streublumen auf Wandung. Unterglasurblaue Manufakturmarke. Min. best. Altrest. H. 14, B. 11 cm. 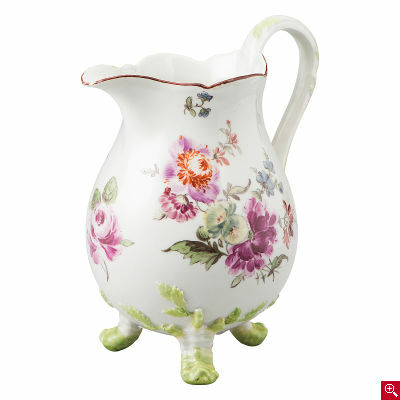 Creamer with colourful flowers. Gotzkowsky, Berlin 1761-1763. Porcelain, painted in polychrome colours. Bouquets of flowers and scattered flowers on the wall. Underglaze blue manufacturer’s mark. Slightly chipped. Restored. H 14, W 11 cm.